County Kerry, traditionally known as "The Kingdom", is renowned the world over for its beautiful scenery, including Ireland highest mountain, Carrauntuohill (1040m/3414ft), the Killarney National Park and lakes, beautiful sandy beaches, cliffs and rocky headlands, magnificent walking terrain, cycle routes, great golf courses, an abundance of deep sea, lake, river and shore fishing, canoeing, windsurfing, horseriding. We also offer our own walking and equestrian short break packages - please check out our Activity Breaks section. These are just some of the facilities you can enjoy. 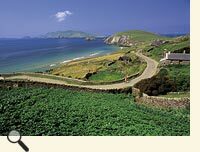 Touring the Ring of Kerry is a must, as is discovering the many pubs of this vibrant and colourful county. Glenbeigh (in Gaelic: Gleann Beithe - Valley of the Birch Trees) is a beautiful vibrant village situated by the Atlantic Ocean, at the foot of the mountains of the Iveragh Peninsula, on the Ring of Kerry. Walk on the 6 miles of golden, blue flag beach of Rossbeigh, while breathing the fresh Atlantic sea air. The village of Glenbeigh has great pubs and restaurants where you will have the opportunity to hear traditional Irish music or even partake in some dancing! flag winning beach is the perfect location for swimming, surfing and sunbathing. While walking along this beautiful strand one can see both Inch Beach, and along the horizon the beautiful mountains of the Dingle Peninsula. Burkes activity centre is located just a 5 minute drive from the Lodge. Here families can avail of pony trekking, the childrens maze, crazy golf, a holistic centre and animal pet farm. The Outdoor Adventure Centre at Cappanlea is just 10 minutes' away and the famous Caragh Lake and River is just a 5 minutes' drive. Kerry Airport and Killarney Bus & Rail Station are 35 minutes' drive. Shannon and Cork Airports are approximately 2.5 hours' drive. There are 2 companies who operate equestrian centres in Glenbeigh. Both Currnanes? and Burkes offer pony trekking & horse riding around the scenic Glenbeigh area through the curragh mountain and also along Rossbeigh beach. The Kerry Ocean lodge is the prefect base for golf enthusiasts. Due to it's close proximity to the many fine championship and links courses in the area such as Dooks, Killarney, Waterville, Beaufort Tralee and Ballybunion Golf Courses all of which are very close to our property.